“The dark clouds of protectionism” gathering over the air travel industry in Europe and the United States pose a significant threat to the millions of travellers who have benefitted from new choice in the market, said Etihad Airways President and Chief Executive Officer James Hogan, in a keynote speech in London. Addressing the Aviation Club, Mr. Hogan said international regulators should recognise that, “investing in success is not a crime; blocking competition would be.” He was speaking the week after European and US carriers again attacked Etihad Airways’ rapid growth of the last decade. 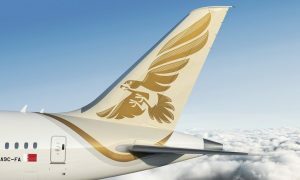 Mr. Hogan said Etihad Airways’ shareholder, the Government of Abu Dhabi, had chosen to invest in a new airline at a time when many factors combined to offer major opportunities. “It saw the opportunities from a new world order in terms of international commerce, from its geographical position and from modern aircraft technology which meant that for the first time, it was one flight away from almost anywhere in the world,” he said. The result, he said, was an airline that had grown to serve 14.8 million guests in 2014, over a network that now reaches 111 destinations. To achieve that rapid growth, in an industry with such high costs of entry, had required significant investment, said Mr. Hogan. 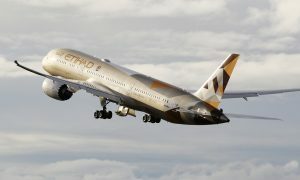 “Etihad Airways has received investment from its shareholder, the Government of Abu Dhabi, in the form of equity capital and shareholder loans. We have always been clear about that. “The shareholder knew those amounts would need to be significant. It was, after all, setting up a national airline in 2003, decades after most governments. 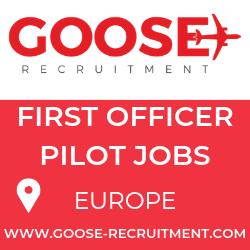 It was investing in an incredibly capital-intensive industry, one which requires significant investment in the obvious items of aircraft and engines; but one which also requires heavy investment in the less obvious items: people, training, technology, a headquarters building – every single thing had to be started from scratch. “To have any chance of success, Etihad Airways had to get to a size and scale that could compete against the networks of airlines that had not only been operating for years, but had benefited from decades of government investment and infrastructure support themselves. “To become a serious competitor in long haul hub-and-spoke air travel, there is a very, very high cost of entry. “Our shareholder set clear parameters for that investment. The airline had to get to profitability within a decade. And in the long term, we have to deliver a return. “Because we have satisfied those conditions, because we have grown more quickly and more successfully than our initial targets, our shareholder has invested further. It has invested in success. Just like any other rational investor. “Our shareholder may be national but when it comes to money, it is very, very rational,” he said. Mr Hogan also questioned the claims of the airlines campaigning against Etihad Airways. “Some of the carriers attacking us claim they are losing market share. We’ve started some analysis on this issue and although the detailed study will take some time to complete, I can say that our initial studies already suggest that those claims are true. We admit it! “But that so-called loss has resulted in thousands of new passengers for these suffering airlines, thanks to the market stimulus we provide. 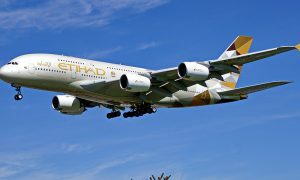 Mr Hogan said it was telling the British Airways had not joined the other legacy carriers in attacking Etihad Airways. He finished by saying that this is a debate about competition. “When it comes down to it, competition is what the market wants. “It is certainly what the customer wants. People want choice when they travel. Choice means they know things will constantly improve. That’s the same whether you are sitting in Abu Dhabi, or in London, Manchester or Edinburgh. “It is certainly what the wider economy wants. Air routes stimulate trade and tourism. Trade and tourism stimulate economic growth. Every air route is worth tens or hundreds of millions of pounds of economic impact. We know that is true in Abu Dhabi, as detailed economic analysis has shown. “But it is also true in every destination we fly to – there is a reason that Manchester was so keen to encourage our second daily flight. There is a reason Edinburgh is so delighted we start direct daily flights this year. There is a reason Heathrow is so pleased we are bringing A380s in – on all three of our daily flights by the end of this year.